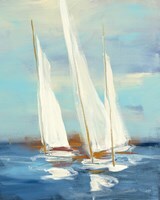 Sailboats with different colored sails makes up Flying Colors by Sally Caldwell-Fisher. The sails on the boats are bright and include oranges, blues, purples, greens and more colors. All of the boats are floating proportionally distant from each other and are all facing right together. The water under these boats has small ripples in them and reflect the boats that float on them. The sky in this piece fades from light blue to a light beige color. 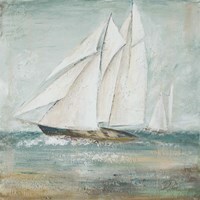 One put with a frame or canvas finish, this print is perfect for sailors, fishers and people who live near or love to be around the sea. Frames and canvas painted sides that include colors that are in the print compliment the piece nicely by bringing those colors out more.